The moose (North Americae) or elk (Eurasie), Alces alces, is the lairgest extant species in the deer faimily. Moose are distinguished bi the broad, flat (or palmate) antlers o the males; ither members o the faimily hae antlers wi a dendritic ("twig-like") configuration. Moose teepically inhabit boreal forests an temperate broadleaf an mixed forests o the Northren Hemisphere in temperate tae subarctic climates. Huntin an ither human activities hae caused a reduction in the size o the moose's range ower time. Moose hve been reintroducit tae some o thair umwhile habitats. 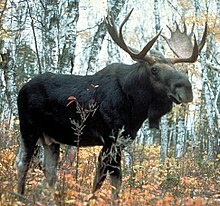 Currently, maist moose are foond in Canadae, Alaska, New England, Fennoscandie, Latvie, Estonie an Roushie. Thair diet consists o baith terrestrial an aquatic vegetation. The maist common moose predators are the gray wouf alang wi bears an humans. Unlik maist ither deer species, moose are solitar ainimals an dae no fuirm herds. Awtho generally slaw-muivin an sedentar, moose can acome aggressive an muive quickly if angert or startlt. Thair matein saison in the hairst featurs energetic fechts atween males competin for a female. ↑ Henttonen, H.; Stubbe, M.; Maran, T. & Tikhonov A. (2008). "Alces alces". IUCN Reid Leet o Threatened Species. Version 2008. Internaitional Union for Conservation o Naitur. Retrieved 11 February 2009. This page wis last eeditit on 7 Apryle 2018, at 03:18.